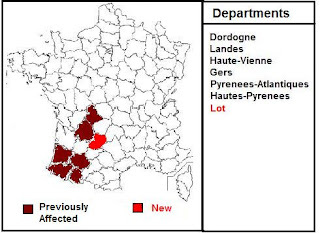 While reports of avian flu have slowed considerably out of France over the past 10 days, today the French MOA has announced their 65th HPAI outbreak, with HPAI H5N1 detected on a farm in the town of Miers, making the 7th Department (Lot) to be impacted since late November. Outbreaks have been relatively small, although they apparently involve five new strains of avian flu, all said to be of `European lineage', and not descended from the more dangerous Asian H5N1 virus. In total, to date, 65 of highly pathogenic avian influenza outbreaks in poultry were detected in 7 southwestern departments of France.